In Minnesota, outdoor living is a high priority during our beautiful weather in spring, summer, and fall. From entertaining guests on decks and patios, complete with outdoor cooking and dining, to safe outdoor play areas for our pets and children, Twin Cities homeowners treat the outdoor areas of their homes as extended living space during much of the year. Creating and maintaining our outdoor living areas requires time and skills, and most homeowners rely on professionals for these jobs. 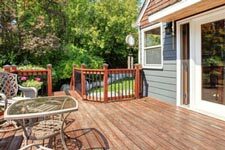 Wood Decks – For your existing wooden deck or balcony, our expert handymen can power-wash and stain, repair, or modify your deck, quickly and professionally. If you don’t already have a deck, we can create one for you in any design, shape, or size. Use your imagination, and then let our talented carpenters increase your outdoor enjoyment with a beautiful new deck. Patios – Hard-surface patios are a popular alternative to wood decks. Created of concrete or pavers, they provide enduring beauty. The expert craftsmen from our Twin Cities handyman service can create a beautiful patio for you or maintain, clean, and repair your existing patio at a low, affordable cost. Outdoor Dining Areas – Call on our team of experts to create or maintain your outdoor dining area. From custom barbeque pits to built-in seating and installation of gas grills, your imagination is the only limit. We can supply the expert craftsmen you need. Sidewalks & Pathways – The walkways and sidewalks around your home and yard are important. They make it easy to get around your property and protect your landscaping. Maintaining these features is important as well, since broken, sunken, or uneven walkways pose safety hazards. Let us fix damaged or unsightly walkways or create brand new ones for your home. Fences & Railings – Fences around your yard protect your privacy and keep intruders out and children and pets safely enclosed. Railings on porches, steps, and other areas add additional measures of safety. We can help you with maintaining and repairing these features or with adding brand new fences and railings. Retaining Walls – Whatever features you already have in your yard, or would like to add, our Minneapolis St. Paul handyman service company is the only call you need to make. Our team of professionals in all trades is ready to help you create and maintain just about anything around your home. Yard & Garden Services – Count on us for the full range of services around your home, yard and garden. From professional leaf and debris removal to help in creating outdoor features like raised garden beds and lawn borders, one call to our Twin Cities home handyman service will get the job done quickly and beautifully at a low cost that makes sense for any budget. During our two decades of experience in managing properties throughout the Minneapolis St. Paul area, we’ve created an extensive network of building trade experts to handle home maintenance, repair, and remodeling needs. By creating HandyQuick, we have made that network available to all homeowners, landlords and property managers in the area. Inside and outside of your home, we are your one-call source for every job you need to have done. Call us today with your needs, and let us show you how HandyQuick provides the highest quality of service at great low prices.